RS3 Sedan – Lots of news on this recently, it’s basically the RS3 with a boot/trunk. A5 / S5 – Audi plan to introduce the new A5 coupe in March 2017, with a corresponding S5 variant. It is expected that the S5 will have circa 350 hp, like S4. The A5 / S5 Sportback and Cabriolet are two months later, in May. Q5/SQ5 – The all-new Q5 and SQ5 are targeted for April 2017. 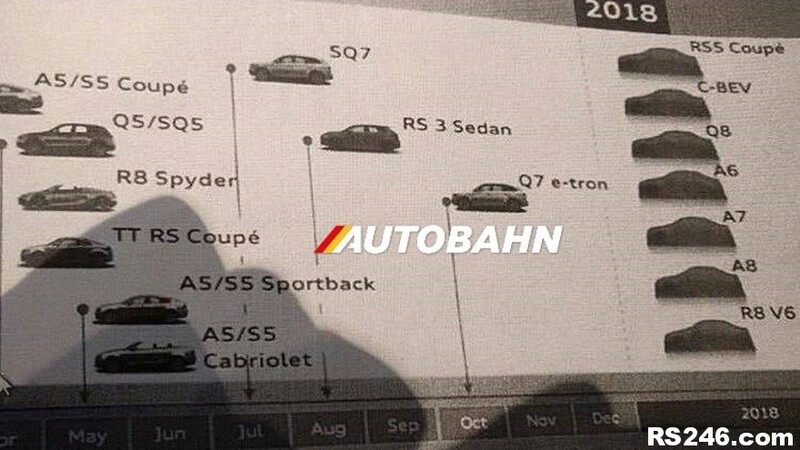 The Q5 is likely to be powered by an assortment of engines sourced from the A4. Q6 (C-BEV) – Concept Battery Electric Vehicle, an all-electric SUV. Based on the same MLB 2 platform as the Q7, with a range of over 300 miles and perhaps use a battery rated at 90 kWh. Q7/SQ7 – Specifics are unconfirmed for the SQ7; potentially a diet and more power from an electric supercharger or the V8 from the RS7. The hybrid Q7, the Q7 e-tron is due in October 2017. Q8 / RS Q8 – Representing the flagship of the “Q” range, the Audi Q8’s range is projected to be between £50,000 for an entry-level turbocharged 3.0-litre V6 petrol model and £90,000 for a twin-turbo 4.0-litre V8 RS Q8. R8 – A V10 R8 Spyder in May 2017 with the rumoured V6 R8 targeted for 2018. TT RS Coupe – The new TT RS debuts in April 2017 (with manual transmission), with about 400 hp from the 2.5 TFSI five-cylinder, which is shared with the RS3. Whilst there are signs of new releases of the A6, A7 and A8, the A4 does not appear in the list.